I'm usually a coffee drinker but when the mood strikes me I can become a bit of a tea fanatic. Recently I had the pleasure of participating in a tea tasting by T2 at work. (I know I'm spoilt rotten at my workplace.) I was so inspired by two of the teas I tasted I did something very unusual for me... I went straight online and bought them both. Ok so I lie.... It's not that unusual for me. I truly enjoyed them so much that I had to have them. The first was an iced tea - a tisane - of strawberry and cream. I won't talk too much about that now, suffice to say it reminded me very much of my childhood eating strawberry and cream lollies but was amazingly refreshing to drink. The second tea I fell in love with was a French Earl Grey. I'm not usually a black tea drinker, but the fragrance of this tea is just so fruity and fresh that I fell in love with it before my first sip. I've been feeling a little under the weather for a few days with a sore throat and thought that this tea would be just the thing to sooth my throat and warm me up on a cold winters day. 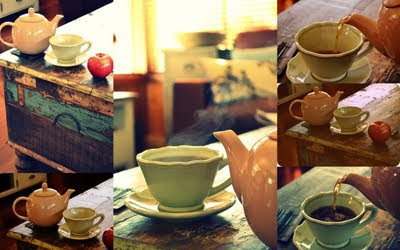 The thing I really love about tea the most is the process of making it, and the implements for serving it. I love that it takes time to brew. There is an art form to getting it right. Certain brews don't respond well to scalding. And leaving the leaves in too long can ruin others. In other words tea requires thought and care. I love the idea that you can put effort into it to make it something of a beautiful ritual. As I said I love the implements of tea too. I love tea pots and tea cups. I love dainty old china cups and saucers that have become slightly stained with too much love over the years, as well as modern mugs of bright inspiration. Today though I was in the mood for something nostalgic and grounded. I chose this chunky mint green cup which has a weight to it usually only associated with coffee mugs. It sort of made me feel grounded and solid drinking from it. (Yes I was having a tea moment). I love the way it compliments the simple tea pot used. Something about this whole set up (including the apple) made me feel much more centered and relaxed after the ritual of tea.